The title of this blog post might seem a little dramatic and fanciful but it’s nothing if not apt. However, in the past two weeks I’ve been feeling an overwhelming sense that I’m not reading quick enough or easily enough and that my reading is floundering. Father, I confess: it has been over a week since I last finished a book. I know what you’re likely thinking: ‘Emma, that’s ridiculous, that’s still a good reading pace, some people don’t finish more than a book a month anyway!’ It’s true that I’ve had family, friends, and colleagues alike marvel at how many books a typical online book lover thinks is “normal” to read in a year – that amount is many more than the average reader “offline” (if we can call it that) will consume. Despite knowing all this, in this age of scrutiny of reading progress aided and abetted by Goodreads and Twitter updates, I feel like I’m slacking, despite the fact that one of the two books I have on the go at the moment is an 800-page chunker. 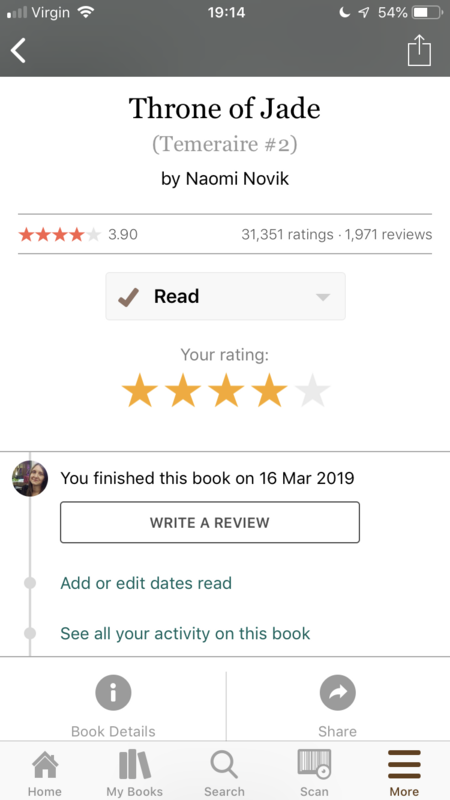 It’s plainly ridiculous that I feel like I haven’t finished a book in FOREVER when, in fact, I finished reading Throne of Jade by Naomi Novik on 16th March. It’s not even that I feel like I haven’t read many books this month, it’s that, somehow, the fact that the online reading community uses social media such as Goodreads and Twitter to track reading progress makes it feel like the community is encouraging nigh-on constant reading and finishing of books. You finish a book, you make sure to let Goodreads/Twitter know, you gush/rant about it as appropriate in a review, and then you move onto reading the next book. Lather, rinse, repeat. Reading slumps and book hangovers are permissible, of course, and you should take to said social media to lament this sorry state of affairs which your fellow book lovers are sure to empathise with! Have you ever felt like you’re not reading much even when you’re still reading consistently? Do you ever feel pressured to update your reading progress daily and weekly? 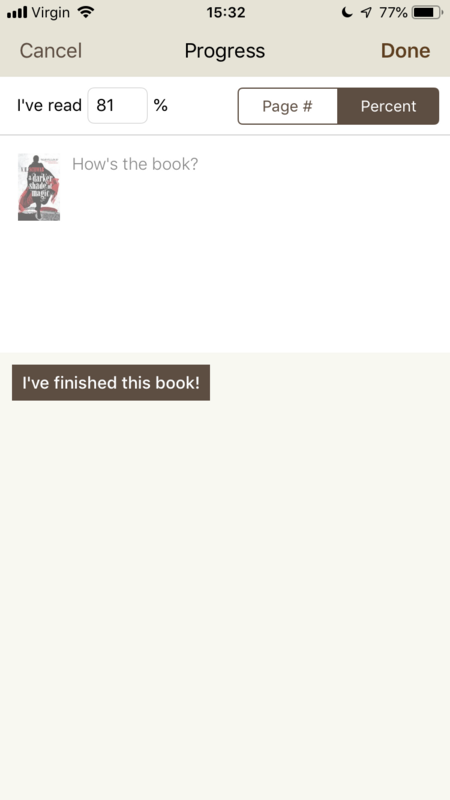 Or do you use Goodreads in a different way and not really use its ‘update your progress’ functions? Let me know in the comments below! I try to resist going onto GoodReads when I’m not reading as much as normal because I start feeling bogged down over it. In January and February combined, I read almost 40 books, but this month, I’ve only read, like, 4 or 5. Granted, I’ve also been busy with schoolwork. I don’t like going onto GoodReads at times like these because most of my GoodReads friends read 2-5 books a week and I don’t like that little green monster rearing its ugly head. I think I probably updated Goodreads way too much, it’s just a habit now, and it’s hard for me to break! That’s true but wow 40 books is definitely amazing! I think you just have to remember that some people would read 40 books in a year and that’s totally fine too… it’s all about staying in your lane and reading the amount YOU are comfortable with. If that’s 20 books one month and 3 the next then that’s fine! I love GoodReads because it let’s me keep up with books I’ve read, or even remember books I’ve heard of and want to read someday, but it does sometimes make me feel a bit overwhelmed. I used to update it every time I read, but I broke out of that habit because it stressed me out. I still use it to keep up with the books I read, and it has actually increased the number of books I read because of this, but it definitely makes me feel worse when I do have a dreaded reading slump, or just read a really long book that takes foreeeeever to get through. Yeah the habit is really hard to break! I totally get that if you’re on a roll with reading, it can make you feel great like you’re reading all the things and crossing books off your TBR shelf and life is good – but then when you’re in a slump and all it shows you is everyone around you being like that whilst you flounder… well it’s easy to get disheartened! I resist the urge to update Goodreads constantly, and tend to only when I’ve read a big chunk. But some books are fast reads and require little concentration and others need a greater investment. 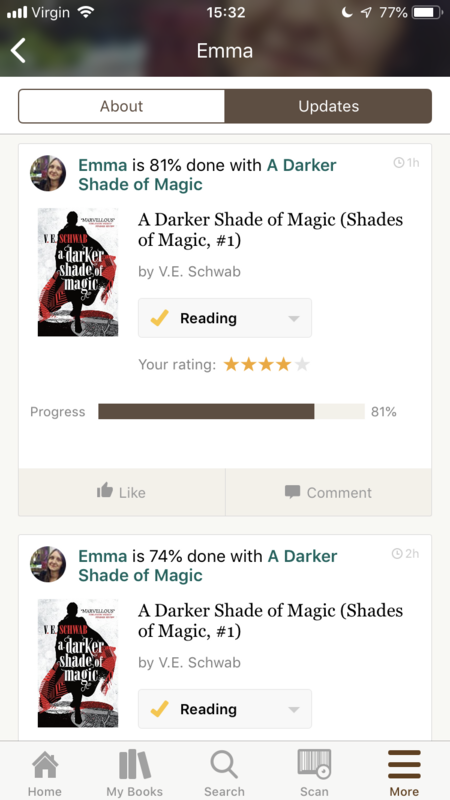 If I feel I’m not making progress (and that anyone on Goodreads has noticed/cares! ), I make a comment when I do a reading update – a quote or a reflection, so that when I look back I can remember what I was savouring. I definitely know what you mean! Especially with longer books, even if I’m reading them consistently it can make me feel like I’m sort of stuck in place. Yeah, I felt like I was taking FOREVER to finish a book. I guess that’s also part of the “problem” of reading so many 300/350ish pages YA fantasies and then being confronted with a complicated 800 page chunker of a book – it’s the outlier that breaks the usual pattern and rhythm!